One of the best things about being a SLSer (Science-Life-Styler) is that you approach all facets of life with the same adherence to the scientific method. So isn’t it natural that this outlook applies to your own body and your health? Yes, of course it does. I do this myself all the time. In fact, quite a few years ago I decided to be proactive about it. I decided that I wanted to control my own intake of dietary supplements. I became convinced that I wasn’t getting the optimal complement of nutrients through my regular diet so I took off to research a variety of commonly available vitamins and supplements in order to better understand, from a scientific point of view, how my body could benefit from them. The result is what I call “My Cocktail” of additives I take on a regular basis. I thought I’d post my cocktail here. I recommend that you do your own research and come up with your own cocktail depending on personal requirements and limitations. Please note that I am NOT advising you to take any of these supplements. I’m simply saying that you should consider researching your own cocktail for improved health and longevity. As I’ve done, you should discuss each additive with your physician. 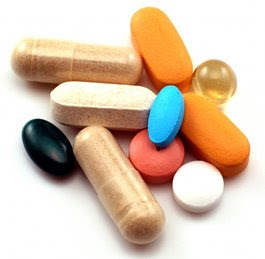 In a couple of cases, the research material I used in deciding to take a particular supplement comes directly from Scientific American, and in some cases I reviewed articles from the New England Journal of Medicine and the Journal of Endocrinology. One supplement that I wanted to mention specifically is Vitamin D (the D3 molecule known as cholecalciferol). Please refer to the excellent article “Cell Defenses and the Sunshine Vitamin” in the November 2007 issue of Scientific American describing the science behind how D3 strengthens the immune system. D is created by skin cells from a chemical reaction when skin is exposed to ultraviolet B (UVB) light. It makes a lot of sense that most people today don’t get enough direct sunlight on the skin in order to synthesize D naturally. This one vitamin has drastically reduced the number of times I’ve been sick in the past two years since I started taking it. Another supplement that needs clarification is DHEA, a hormone produced by the adrenal gland known as dehydroepiandrosterone. There is quite a bit of debate about DHEA and evidence that the body’s decline in DHEA production as you age produces a very well known disease called death. In fact, declining production of DHEA may be a genetic trigger for the aging process. I’ve looked at DHEA for some time now, and there are many purported benefits such as improved longevity, works with Vitamin E to reduce the atherosclerotic process, decreases abnormal platelet aggregation, decreases low-density lipoprotein (LDL) or “bad” cholesterol, restores immune balance, and increases libido just to name a few. I also began taking a resveratrol supplement which is receiving much interest in the research community. There is a very informative article “Unlocking the Secrets of Longevity Genes” in the March 2006 issue of Scientific American that examines the genetic effects of longevity. Basically, resveratrol is a Sirtuin activating compound present in red wine. Sirtuins is a collection of genes such as Sir2 which mimics biological stress, such as calorie restriction, shown to be necessary to produce longevity. I’m also quite happy to consume a little of my favorite Pinot Noir wines from Oregon’s Willamette Valley to extend the resveratrol effect even more!